I had the pleasure of arriving to Sheridan, Wyoming via road trip. My father, recently retired, proposed to turn the drive into a camping trip, and he and I spent three great days traveling the plains and mountains of Utah and Wyoming. Passing through Grand Teton and Yellowstone National Parks, the drive was extraordinary. Coming from my dry home of Flagstaff, Arizona, I was taken by how green everything was, and spent hours watching the grass dance about in the wind. After arriving in Sheridan, my fellow Ranch Crew members and I were quickly educated about the various grasses in the region; what was once a monotonous green field became a mishmash of Western Wheatgrass, Smooth Brome, Yarrow and Silver Sagebrush. 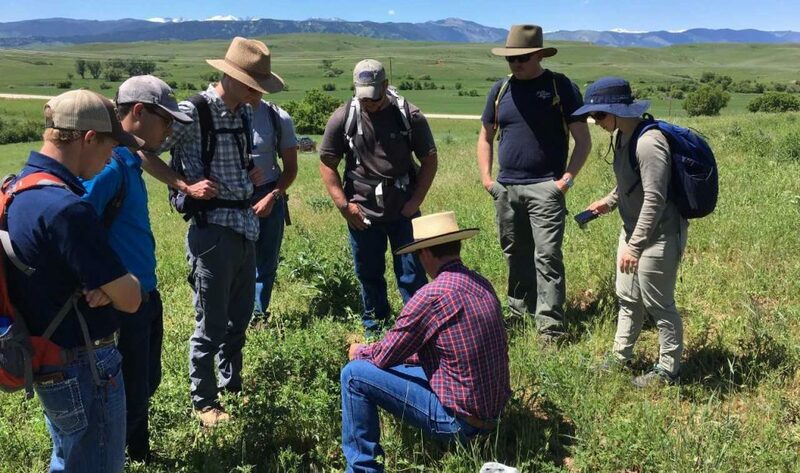 Under the tutelage of Brian Mealor, the Director of Sheridan Research and Extension Center with an exquisite grass knowledge and mustache to match, the Ranch Crew team grew to understand how various local grasses and forbs interacted in the northern Wyoming ecosystem. We not only learned to identify a large range of plants, but about the intricacies of their structure, their strengths and weaknesses as forage, and their abilities to resist and respond to disturbances as well. Beyond individual plants, we learned to think about the role of grasses and their managementfrom a systems approach. Specifically, Dr. Mealor facilitated our understanding of the impact and severity of invasive weed species in the ecosystem. Weeds are a plant that interferes with the management goals of a region; invasive ones are introduced and have a nasty knack of spreading uncontrollably. In our region of interest, the old guard of Bulbous Bluegrass and Cheatgrass are being joined by the deadly duo of Ventenata and Medusa Head. 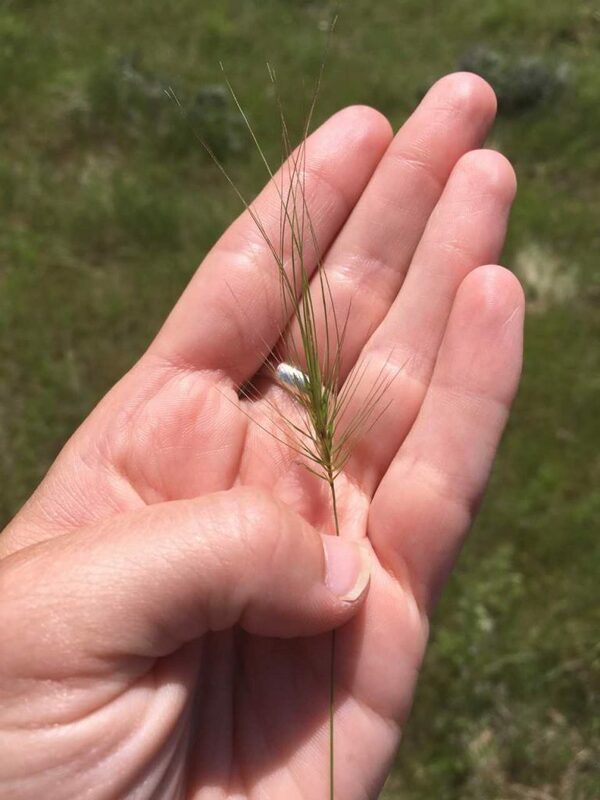 Cute names aside, these weeds are terrible for Wyoming’s landscape; they outcompete native grasses, are of horribly little forage value to grazing species, and spread fast and far. The reason these invasive species are so successful in comparison to native grasses is unclear. Unclear, too, is the best management approach to combat their spread. A successful management strategy doesn’t simply destroy the target weed. Rather, successful weed management kills plants we don’t want, but equally importantly maintains the integrity of those species we wish to protect. This balance is a difficult one to strike. When coupled with resource constraints faced by landowners and non-profits, effectively managing invasive weeds becomes a frighteningly complex and difficult issue. Driving around Wyoming now, the same hills that once filled me with calm and yearning now bring forward mixed emotions. That grass that caught the wind just so? Medusa Head. That sea of dancing purple? Cheatgrass. I have learned the harsh lesson that green does not necessarily mean good when it comes to the rangeland. However, despite spending so much time learning and reflecting upon the problems that face us, I also know that all is not bad: there are state governments, like Wyoming, allocating large blocks of funding to tackle these issues; there is a growing body of research to understand and implement best approaches; there are brilliant and passionate folks devoting much of their lives to solving these complex problems. It has been a great honor to spend time learning from and working beside these people, and I am glad to lend my hand in the fight to combat this threat to our rangelands. 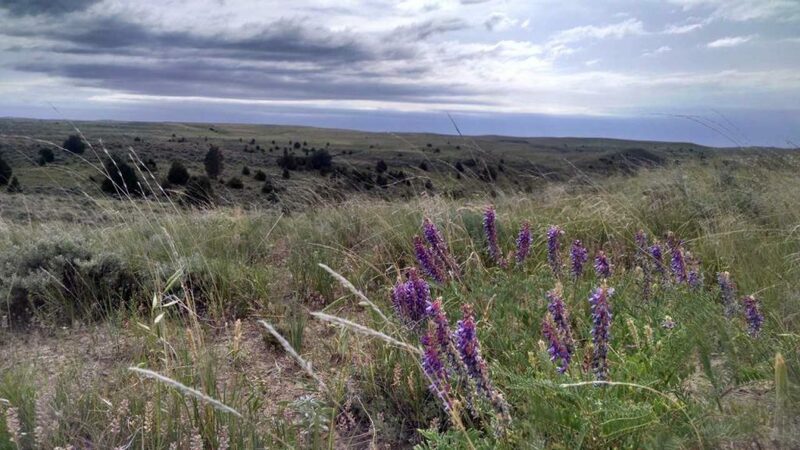 This entry was posted in Botany, Grazing, Mapping, People, Ranch Crew, Ranch Crew 2018, Wildlife and tagged Reid Lewis. Bookmark the permalink.